Kids love mac n’ cheese because it’s sooo cheesy. The secret we all keep is that grown-ups love it, too, and for the same reason! Retooled into a delicious soup, this dish is a favorite for children of all ages. 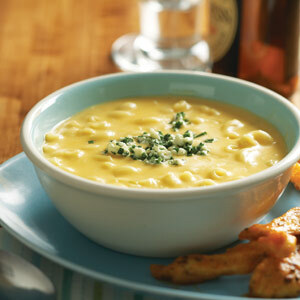 To achieve a silky-smooth texture with this cheesy soup, buy a block of Cheddar and shred it yourself. Packaged shredded Cheddar often contains an anti-caking agent and can have a grainy, unpleasant mouth feel when melted. Cook macaroni in a pot of salted water according to package directions; drain it and set aside. Sweat onion and celery in butter in a large saucepan over medium heat until soft, about 5 minutes. Stir in flour to coat and cook 1 minute. Deglaze pan with wine; simmer until nearly evaporated, then stir in broth, mustard, nutmeg, and cayenne. Simmer mixture until it’s slightly thickened, about 5 minutes. Whisk in milk and warm through. Do not let soup base boil or base may become grainy. Add Cheddar 1 cup at a time, allowing it to melt completely before adding the next cup. Stir in macaroni, lemon juice, and salt; remove soup from heat. Combine blue cheese and chives in a small bowl. Garnish each serving with blue cheese mixture. Add the Cheddar in stages, whisking after each addition until cheese is completely melted into the base. After the cheese has melted, add the macaroni, stirring to break up any clumps. Do not let the soup boil.